Thanks to a fortuitous set of circumstances and the largess of some very good friends, Lynda and I were invited to attend a special preview screening of the latest feature film based on the life of Truman Capote. Yes my fellow cineastes, this coming weekend writer/director Douglas McGrath's INFAMOUS will be released in several major cities. It's arrival in selected theaters comes approximately one year after Philip Seymour Hoffman's Academy Award winning portrayal was being projected on thousands of screens nationwide, and not only is the central character the same, both films cover precisely the same period in Capote's life albeit in considerably different fashion. This, of course, begs the question: Is INFAMOUS worth seeing? 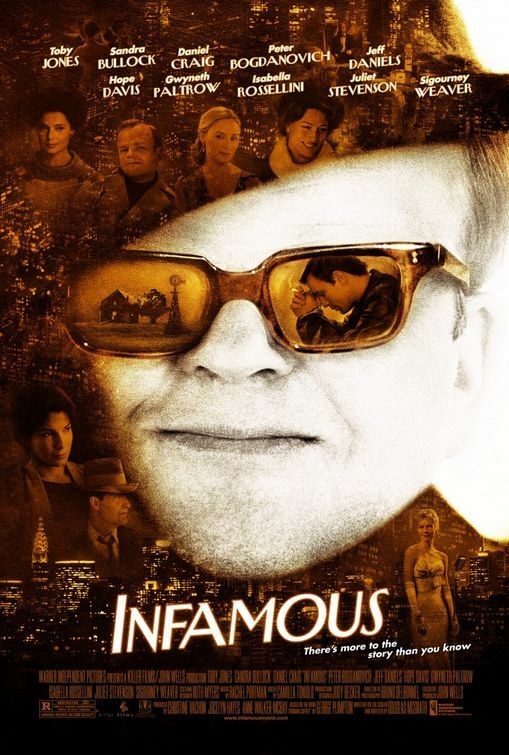 Like CAPOTE, INFAMOUS is also a compelling study of the complex and tortured relationship between the famous writer and Perry Smith, one of the two murderers convicted of the brutal slaughter of a well-to-do Kansas farm family. The overall tone, however, is lighter, with numerous scenes of Truman spending time with his "Gotham glitterati" and, especially, some very funny moments when Capote, accompanied by his closest friend, Nelle Harper Lee, first arrives in the Sunflower State. But make no mistake, the ending is a powerful one that draws the conclusion that the strong, emotional bond Truman formed in prison with Perry ultimately brought about not only the destruction of Capote's career, but the destruction of his soul as well. "I've come to feel with deep heart-sickness that there were three deaths on the gallows that night," says Lee, and one cannot help but believe this is true. The cast is excellent. Toby Jones' portrayal of Truman Capote is riveting and is possibly a better imitation than Hoffman's more nuanced performance. For my money, they are both superb -- had INFAMOUS come along first, Toby Jones might have been nominated for an Oscar as well. Sandra Bullock, as Nelle Harper Lee, will surprise even her harshest critics. She certainly holds her own in comparison with the marvelous Catherine Keener. Sigourney Weaver, Isabella Rossellini, Peter Bogdanovich (as Bennett Cerf), Jeff Daniels and Daniel Craig (as Perry Smith) all deserve special mention as well. Amazingly, Gwyneth Paltrow reportedly earned a staggering $3.6 million to play Peggy Lee singing a three minute rendition of "This Thing Called Love" in the opening scene. This makes Ms. Paltrow the highest paid actress ever for a cameo appearance. The scene is important, it establishes the concept that sadness often lurks beneath the spotlight, a theme which will increasingly pertain to Mr. Capote as the film proceeds. Still, this was money clearly wasted in a film possessing outstanding production values throughout given its relatively low budget. True, the ground being covered is virtually the same as we've seen before. So what? I recall having traveled the same hiking trail more than once and I inevitably discovered something new and different on each trek. The same analogy holds for these two feature films; both are extremely well made and both provide interesting and enlightening insight into a fascinating and talented personality.